Meet Tskili – one of the hardest working birds in environmental education. His name translates to Great Horned Owl in Cherokee. Tskili’s story starts in Montana in 1992, when he was just a year old. He was hit by a car and was discovered badly injured by a passing motorist. Many Great Horned Owls are tragically killed along our roads each year as habitat loss pushes them closer to civilization and all the dangers that come with it. Although the breaks and fractures in his wings were irreparable, at just 2.5 lbs, it’s a miracle that he survived. Being released to the wild was no longer an option. After careful bandaging and cage rest, Tskili accepted a job as an Education Ambassador so he could help teach people about birds and conservation. He started accompanying Education Director Mary Anne Weber to her owl programs in Montana, where he helped educate thousands of youth and adults every year. In 1999, Mary Anne moved to Texas to join Houston Audubon, where she started building new aviaries for the education raptors. Tskili joined her in early 2000 and has since assisted the education team with almost 200 presentations annually and has touched tens of thousands of lives with his beauty and inspirational story of survival. 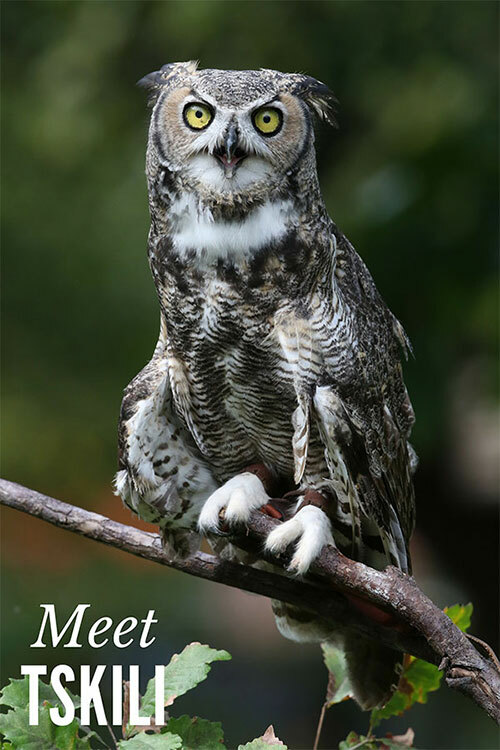 Stay tuned next Tuesday for the story of Simon, a young Great Horned Owl who became a vital player in Tskili’s life. If you’d like to help Houston Audubon’s conservation efforts, including taking care of our feathered friends like Tskili and Simon, please contribute for Giving Tuesday on or before Nov. 27th by clicking here.